When my school came back from fall break, I had a teacher report that one of her classroom iPads had gone missing. I get messages like this quite often, but they are almost always in the building. I can verify this by logging into my Jamf Pro dashboard, and see which IP address it last “checked in” from. Our school has a static IP address, so the iPads will also show that as the last known IP address. I can also have Jamf Pro send me an email if one checks in off campus, I had actually turned this off as we had a student who was at St. Jude off and on last year, so I disabled the alerts while she was there, and I forgot to turn them back on. I had originally set this feature up to help prevent school iPad theft. When I logged in, I had a single iPad show up in my “off-campus” smart group. I clicked on it, and it had been renamed. It’s odd that it was renamed because I have a policy of setting the names from Jamf Pro, so I was curious how that would have happened (I figured it out, don’t worry). At this point, I am concerned. I have an iPad off campus, from an IP address that isn’t one of mine, and it’s been renamed. It last checked in on the previous Saturday. Around this time, I get a phone call that someone has “found” a tablet belonging to our school. We went back and forth on how we could recover it, and I eventually called a detective friend of mine to see what was the best way to proceed. He advised us to file a theft report, but still, go pick it up (with a police officer). He said that if the police picked it up, it would go into evidence, and would be a few weeks before we’d get it back. We proceeded with that plan, and I went to this person’s work to pick it up. When I got the iPad back to school, I charged it, and then it turned back on. I noticed the iPad had been wiped, and the Wi-Fi was off. A light bulb when off in my head as to exactly what happened. 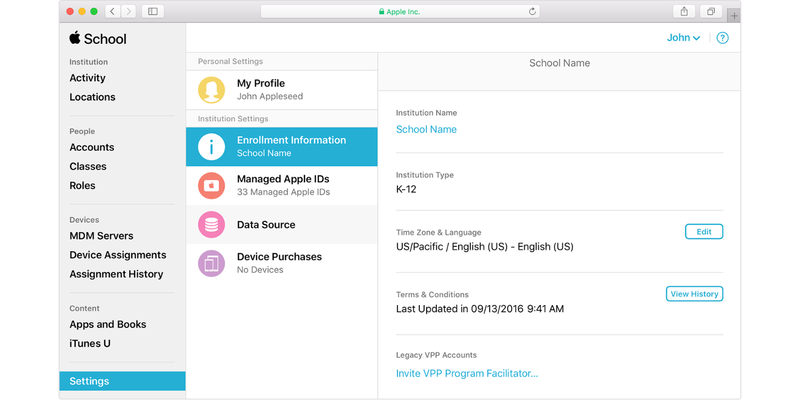 For starters, all of our iPads are enrolled in the Device Enrollment Program (through Apple School Manager). Apple’s DEP system has our iPads straight from the factory tied into our account with them. Once I add it to our MDM, it’s locked to us in a similar fashion to when consumer devices are logged into iCloud. For it to not be this way, I have to “disown” it through a portal Apple has set up. This helps prevent school iPad theft as only the school can let it go. With DEP, large-scale deployments of iPad, iPhone, Mac, and Apple TV are seamless. Once devices have been activated, you can immediately configure account settings, apps, and access to IT services over the air. You don’t need to use staging services or physically access each device to complete the setup. With Apple’s DEP system, even when it was wiped using iTunes, it immediately started restoring itself to one of our iPads. So I suspect that whoever stole it connected it to their Wi-Fi. When it began restoring apps, he got concerned that he could be tracked (and he could), so he flipped the Wi-Fi off and shut it down. Within ten minutes, the iPad was back to normal. The device was also renamed back to what it should have been as well. I have re-enabled e-mail alerts on my Jamf Pro for offsite iPads. I’ve set it up where the wallpaper of offsite iPads is changed to the photo below using a Jamf Pro smart group and Automated Management. Apple gets (and rightly so) a lot of flack for its iPad strategy in education, but this situation shows they’ve built a system that can help deter theft from schools. Had this person not returned the iPad, we could have sent the IP address to the police, and they could have tracked it from there. We aren’t 100% sure how the iPad was stolen as our camera system filled up its hard drive the day before and failed to start overwriting itself, but I suspect whoever stole it now knows stolen iPads from schools aren’t worth stealing. 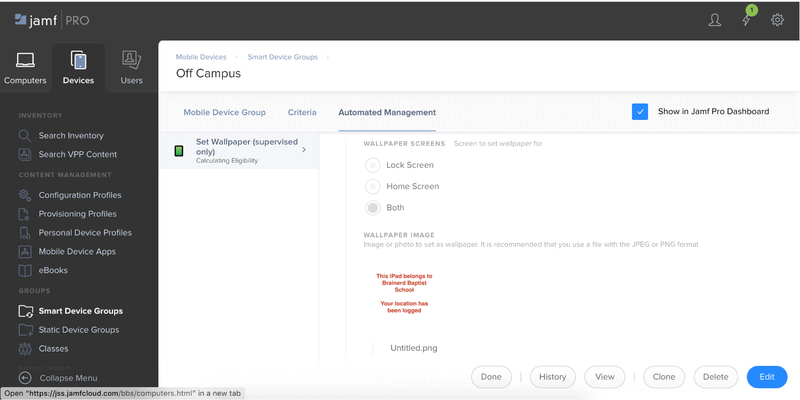 Thanks to Jamf Pro and the Device Enrollment Program, school IT managers can help prevent school iPad theft.